A squeaky toy was possibly the first toy to grab your attention when you were a baby. For centuries parents have cooed, clucked their tongues, or softly whistled to entertain their babies. Rattles of all shapes and materials have had their places as attention-getters, but during the 1940s the rubber, and later, vinyl squeaky toys became the most diverting toy of all. Early rubber squeaky toys were a simple ball with just a hole or a metal whistle disk inside. Later, reed devices were developed to generate different sounds. After the 1940s, soft, pliant vinyl plastic replaced rubber.Today, people can avidly search for the hundreds of colorful rubber or vinyl squeaky toys that were produced by many companies large and small. These simple and diverting toys are now getting the attention of collectors around the country. 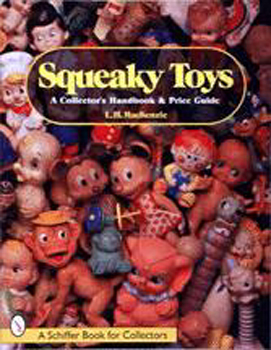 Squeaky Toys is richly illustrated with over 300 color photographs and is complete with a current price guide.